The gap was just too much for Jordan McDougal to make up. [button-red url=”http://results.bazumedia.com/event/results/event/event-3289″ target=”_self” position=”left”] Results [/button-red]Anyone watching the finishing stretch of the St. Patrick’s Day 8k would say that. Elarbi Khattabi, of Waynesboro, Pa.,was comfortably ahead heading back on Pennsylvania Avenue, having broken the race open at three miles. McDougal, of Warrenton, figured the lead was around 20 yards, but that seemed like a conservative estimate. [button-red url=”http://youngrunner.smugmug.com/Race-Photo-Galleries/St-Patricks-Day-8k-2013/i-DDqcQFJ” target=”_self” position=”left”] Photos [/button-red]As the pair looped to a turnaround on 10th street, McDougal had all but given up on going for the win, he was trying to preserve what he had. When he turned back onto Pennsylvania and could see the finish line, he was still sprinting. Shortly before the line, anything an earlier observer had assumed about the race was wrong. McDougal (24:32) passed Khattabi (24:38), who shut it down. 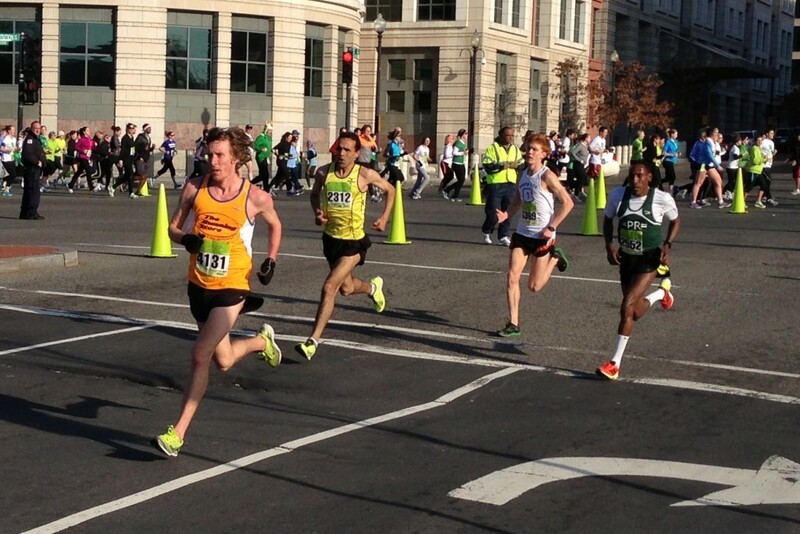 Megerssa followed in 24:46 with Sam Luff two seconds behind and Sean O’Leary 10 seconds later. That wasn’t the only surprise in the race. Women’s winner Claire Hallissey, or Arlington, doubled after having won the previous day’s Four Courts Four Miler and had a comfortable lead over Meagan Nedlow of Salem, Mass. 27:14 to 27:42. Hallissey, a member of the 2012 British Olympic team in the marathon, is gearing up for the NYC Half next Sunday in Manhattan.